I don't normally review movies on my blog, or mention them much, even though I love watching many of them. But I thought to give it an exception as I have recently got around to watching the Assassin's Creed movie. The one from 2016 with Michael Fassbender, Marion Cotillard and Jeremy Irons in the lead roles. I never got around to seeing it in the theatres and finally picked it up very reasonably on Blu-ray. Not that I feel the genre of making movies out of famous videogames is a very successful one, I really only recall the Silent Hill movie from 2006 as being the most decent one and a good conversion from gaming to silver screen. The Tomb Raider ones with Angelina Jolie weren't too bad, but suffered from fairly generic stories. After watching the trailer and seeing what seemed like a fairly high budget, I had a slight hope for Assassin's Creed to be at least quite decent. Sadly though, it falls into a mediocre and forgettable affair. There's nothing really wrong with the production of the movie, lets get that out of the way first; It's well filmed, the fights are well choreographed, the transition from modern surroundings to ancient ones are done well. In general, the whole production value seems to be at a high level, so technically there's nothing here to point out in a bad light. The storyline and the presentation of the main character is what pulls AC down. We alle know that the AC games have a modern storyline, which explains the need to go back into ancient times to solve puzzles and mysteries. In a strange change of events though, the focus of the movie seems to shift back to giving the modern setting far more screen time than the ancient one. Where as the game series got a lot of criticism for shifting between the modern current era to the ancient times far too often in the first release and changed this by giving the player far great game time in the ancient setting from AC2 and onwards. This change in focus made you care more about the ancient ancestor than the current main character, but this movie focuses on Michael Fassbenders role as Cal in modern day. Don't get me wrong here though, it's done a far better job than the first game in this part and pulls your interest more into the current time period from the get go. However, this gives the viewer little incentive to care about what's happening in the 1492 setting of medieval Spain. It's just a backdrop which annoyingly interrupts the plot with fancy action and parkour skills. The fighting is well choreographed with lots of cool moves and fights, but it just feels so uninteresting and bland to watch. The ancient Spain looks grey, brown and dull, far too computer animated for my liking. There's nothing you wish to care about there and the movie certainly doesn't want you to care about it either. 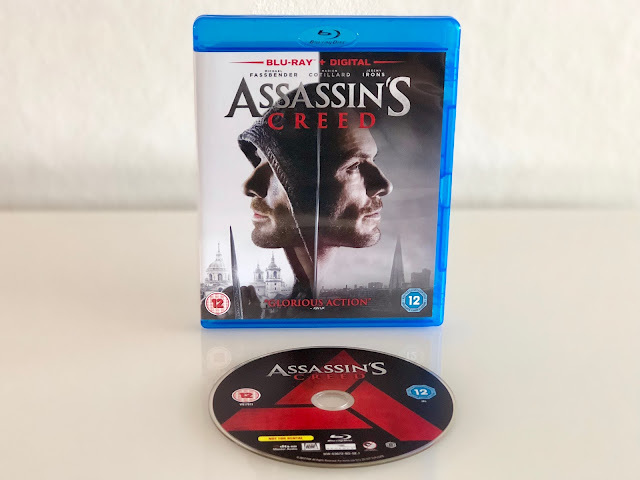 With it's obvious plotline and stereotypical ending, Assassin's Creed sadly turns into a very mediocre affair from there on. The modern setting opts simply for some extremely obvious plot twists and ends up following a route that seems like a boring safe one with predictable outcomes. The AC movie could have been so much more considering the game series leaves a lot of room for tons of ideas and settings. None of which I feel are very utilised here. It feels like the people behind this movie kinda just played the first game and then really didn't bother to study anything else. The movie will leave AC fans disappointed and for non-gamers it will just seem like a generic movie with a sort of time travel twist. Skip this one, just doesn't add anything to the AC franchise at all.